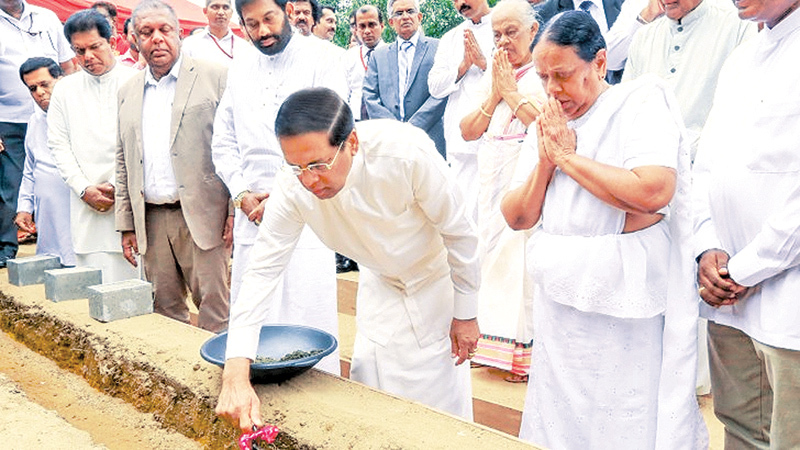 The foundation stone was laid for the construction of the ‘Pandith Amaradeva Sangeetha Asapuwa’ under the patronage of President Maithripala Sirisena in the Ape Gama premises yesterday. The ‘Pandith Amaradeva Sangeetha Asapuwa’ is to be constructed to preserve the work of Pandith Amaradeva for the benefit of the future generation and to fulfill a promise by President Maithripala Sirisena at Pandith Amaradeva’s funeral as well as a result of a request by Pandith Amaradeva. The Pandith Amaradeva Sangeetha Asapuwa, which is to be built on a 120-perch-land under the Urban Development Authority near the Ape Gama in Bathtaramulla, will consist of a library, an archive, a museum and a preservation centre. The Sangeetha Asapuwa will cost Rs.250 million. The President also unveiled the plaque of the ‘Pandith Amaradeva Sangeetha Asapuwa’.